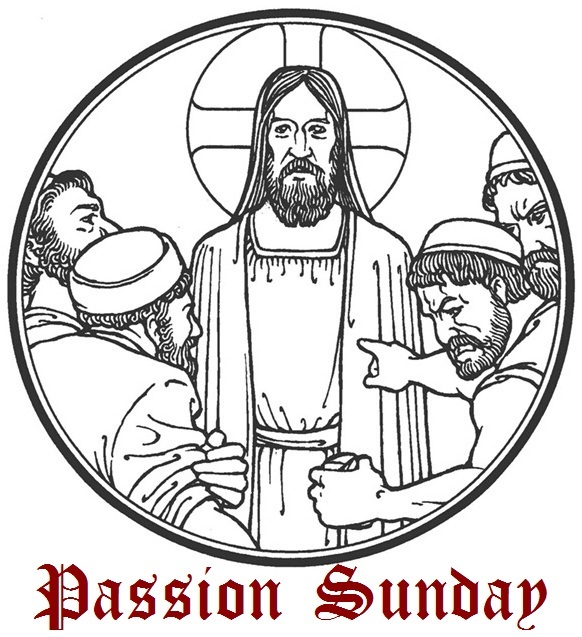 With Passion Sunday the Season of Passiontide has begun and today’s Mass is full of the thought of the Passion of Jesus and of the infidelity of the Jews, whose place in the Kingdom of God was taken by those who were baptized; that is to say the catechumens and the Christians. In the Introit, the Psalmist, exiled among hostile people, represents Christ “against Whom rose up an angry nation” (Gradual). From this point until Holy Saturday the statues and crucifixes are shrouded in violet or purple cloth and holy water fonts are emptied. The “Gloria Patri” is not said and neither is the Psalm “Judica me” in the Preparation. Look down in mercy, we beseech Thee, O Lord, upon Thy family; by Thy governance may we be outwardly protected in body; by Thy favor may we be inwardly strengthened in heart and mind. Through Jesus Christ our Lord, Who liveth and reigneth with Thee in the unity of the Holy Ghost, one God Forever and ever. R.Amen. We beseech Thee, O Lord, mercifully to receive the prayers of Thy Church : that, all adversity and error being destroyed, she may serve Thee in security and freedom. O God, the Shepherd and Ruler of all the faithful, look favorably upon Thy servant N., whom Thou hast been pleased to appoint as shepherd over Thy Church, grant we beseech Thee, that by word and example, he may edify those over whom he is placed, and together with the flock entrusted to his care, may attain everlasting life. Through our Lord Jesus Christ, Who livest and reignest, with God the Father, in the unity of the Holy Ghost, one God For ever and ever. R. Amen. A reading from the Epistle of the blessed Apostle Paul to the Hebrews. Brethren: Christ being come, a High Priest of the good things to come, by a greater and more perfect tabernacle, not made with hands, that is, not of this creation, neither by the blood of goats or of calves, but by His own blood, entered once into the Holies, having obtained eternal redemption. For if the blood of goats and of oxen, and the ashes of an heifer being sprinkled, sanctify such as are defiled, to the cleansing of the flesh, how much more shall the blood of Christ, who through the Holy Ghost, offered Himself without spot to God, cleanse our conscience from dead works, to serve the living God? And therefore He is the Mediator of the New Testament; that by means of His death, for the redemption of those transgressions which were under the former Testament; they that are called may receive the promise of eternal inheritance; in Christ Jesus our Lord. Deliver me from my enemies, O Lord: teach me to do Thy will. V. Thou art my deliverer, O Lord, from the angry nations: Thou wilt lift me up above them that rise up against me: from the unjust man Thou wilt deliver me. At that time, Jesus said to the multitudes of the Jews: “Which of you shall convince Me of sin? If I say the truth to you, why do you not believe Me? He that is of God, heareth the words of God. Therefore you hear them not, because you are not of God.” The Jews therefore answered, and said to Him: Do not we say well, that Thou art a Samaritan, and hast a devil? Jesus answered: “I have not a devil, but I honor My Father, and you have dishonoured Me. But I seek not My own glory; there is One that seeketh and judgeth. Amen, amen, I say to you, If any man keep My word, he shall not see death for ever.” The Jews therefore said: Now we know that Thou hast a devil. Abraham is dead, and the prophets; and Thou sayest: If any man keep My word, he shall not taste death for ever. Art Thou greater than our father Abraham, who is dead? and the prophets are dead. Whom dost Thou make Thyself? Jesus answered: “If I glorify Myself, My glory is nothing. It is My Father that glorifieth Me, of Whom you say that He is your God. And you have not known Him; but I know Him. And if I shall say that I know Him not, I shall be like to you, a liar. But I do know Him, and do keep his word. Abraham your father rejoiced that he might see My day: he saw it, and was glad.” The Jews therefore said to Him: Thou art not yet fifty years old, and hast Thou seen Abraham? Jesus said to them: “Amen, amen, I say to you, before Abraham was made, I AM.” They took up stones therefore to cast at Him; but Jesus hid Himself, and went out of the temple. May these gifts, we beseech Thee, O Lord, merit for us the loosening of the bonds of our sins, and draw down upon us Thy bounteous mercies. Through our Lord Jesus Christ Thy Son. Who liveth and reigneth with Thee in the unity of the Holy Ghost, one God Forever and ever. R.Amen. Be appeased, we beseech Thee, O Lord, by our peace-offerings, and by Thy constant protection, guide Thy servant N., whom Thou hast been pleased to appoint as shepherd over Thy Church. Through our Lord Jesus Christ, Who livest and reignest, with God the Father, in the unity of the Holy Ghost, one God For ever and ever. R. Amen. Draw near to us, O Lord our God, and with everlasting succour aid those whom by Thy sacrament Thou hast called to newness of life. Through our Lord Jesus Christ, Who livest and reignest, with God the Father, in the unity of the Holy Ghost, one God For ever and ever. R. Amen. We beseech Thee, O Lord our God, that Thou wouldst not suffer to be exposed to human dangers those to whom Thou givest to rejoice in this divine banquet. We beseech Thee, O Lord, that the reception of this divine sacrament, may protect us and always save and defend Thy servant N., whom Thou hast been pleased to appoint as shepherd over Thy Church, together with the flock entrusted to him. Through our Lord Jesus Christ, Who livest and reignest, with God the Father, in the unity of the Holy Ghost, one God For ever and ever. R. Amen.